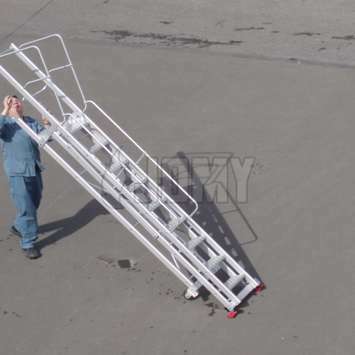 Stepladders adapted to your specific situation: fixed, mobile, with platform, height adjustable, retractable, with fall-arrest system, custom-made,... 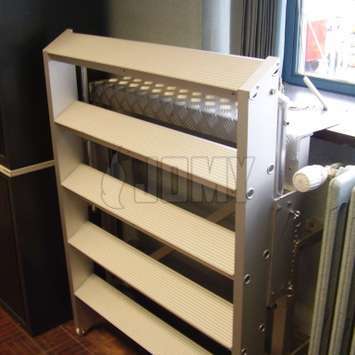 Engineered in marine grade anodised aluminium. 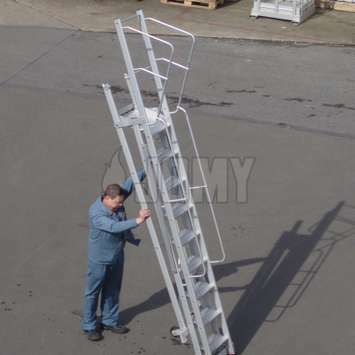 All JOMY stepladders (also known as boatladders) are made of anodized aluminum profiles and meet standard requirements. 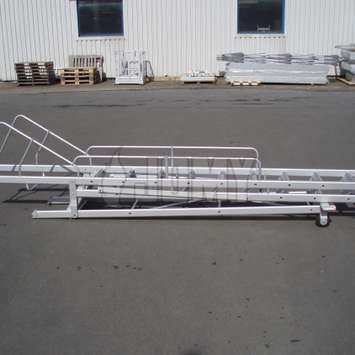 Fixed stepladders are an ideal solution to bridge average differences in height. 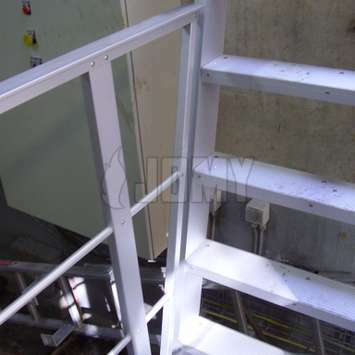 All JOMY stepladders are made of anodized aluminum profiles and designed to be robust and solid for use in industrial environments. 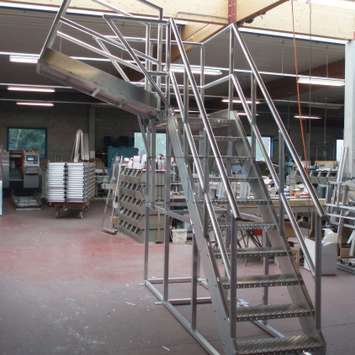 All of JOMY stepladders are custom made to be adapted to your specific situation and to the building, in accordance with the safety requirements. Guardrails are provided to protect against falls. The guardrails and flooring are available in many different types and RAL colors. 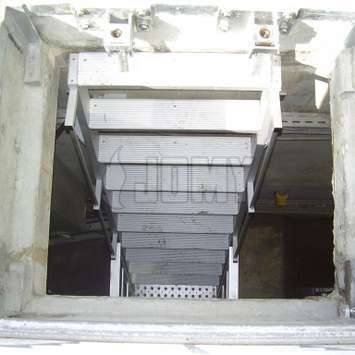 Small wheels beneath the stepladders make it possible to move them to any desired position. 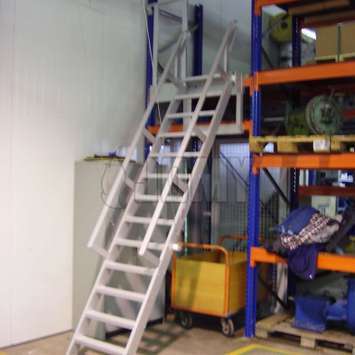 Mobile stepladders are a preferred solution for easy and safe access to machinery controls and maintenance at average heights. 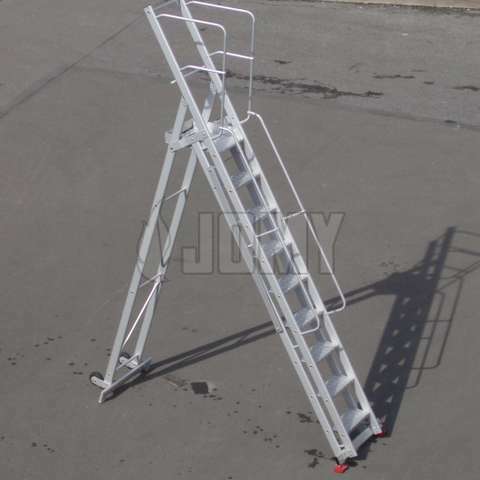 JOMY mobile boatladders are all constructed from anodized aluminum profiles, custom made, and adapted to your specific situation. 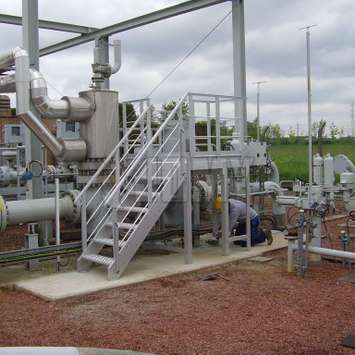 They can be painted in any desired RAL color and various types of steps, guardrails, and other options are available. JOMY retractable stepladders are easy to use and open in seconds. The steps deploy instantly over their complete height when the opening handle is turned. 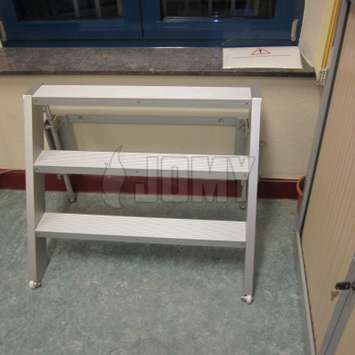 The stepladder is internally counterbalanced by springs, resulting in soft deployment and easy closing after use. 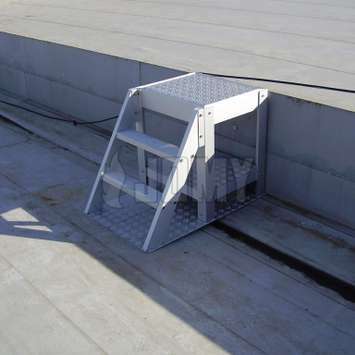 This system is often used to cross small heights like a windowsill or small wall for example. 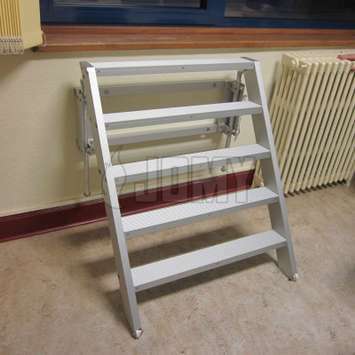 When not in used the stepladder can be folded away to gain space and be hidden by a curtain or small cabinet. 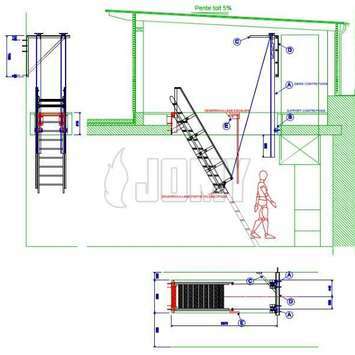 JOMY retractable stepladders can be seamlessly integrated in the architecture of the building. They can be deployed when needed, so that steps never interfere with other daily activities. 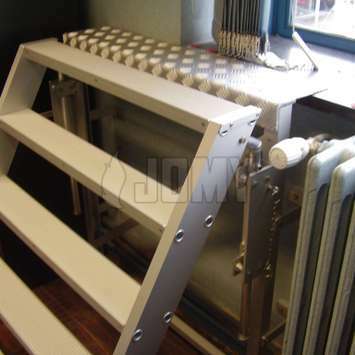 JOMY stepladders are manufactured in anodized aluminum with natural mat finishing. The exterior can be painted in any desired RAL color. To prevent improper use and limit the use of space at ground level or for aesthetic reasons, JOMY stepladders can be counterbalanced. 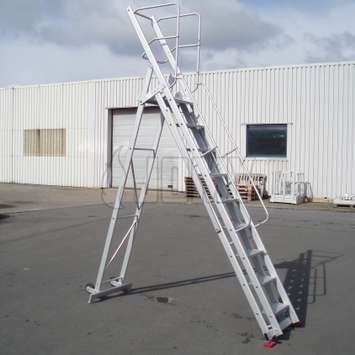 These ladders can be released from above or from the bottom. 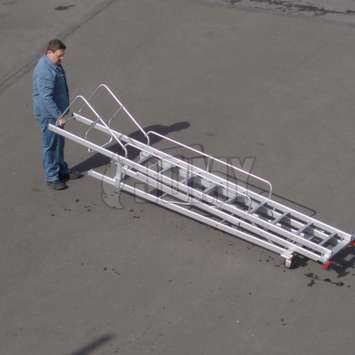 Counterbalanced lead weights are concealed inside the patented side rails of the steps to provide trouble-free use even if snow, ice, or salt air are present. These weights can be engineered completely mechanical or with an electronic brake system. Our counterbalanced stepladders are made from anodized lightweight aluminum profiles and can be painted in any RAL color. 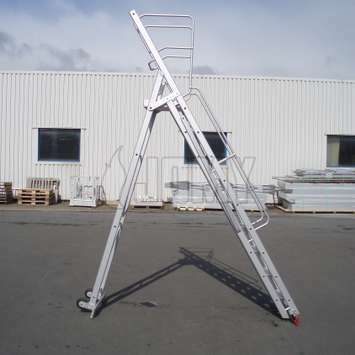 JOMY aluminum stepladders are available with lifelines for increased safety when working at heights. 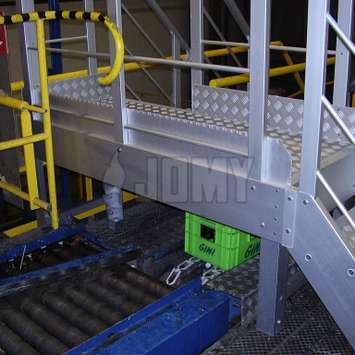 JOMY has developed lifelines based on fixed aluminum rails with mobile carriages. The user attaches his safety-belt to the carriage, which slides over fixed rails to protect against falls and sudden movements. 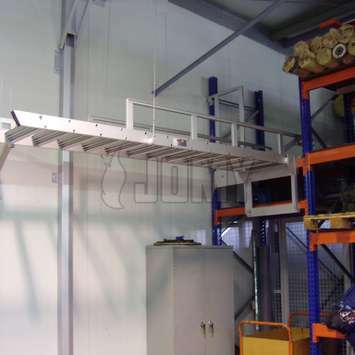 JOMY adapts their stepladders to your requirements. 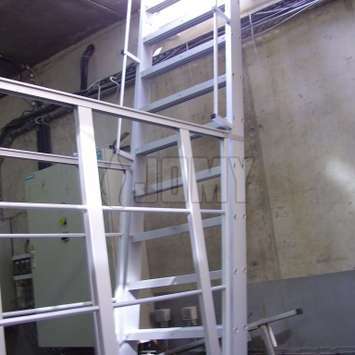 JOMY stepladders can be constructed according your specific requirements. 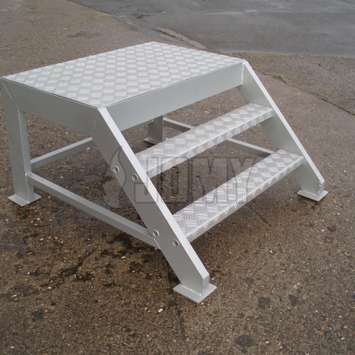 This customized lightweight stepladder comes in several colors, layouts, and other options. 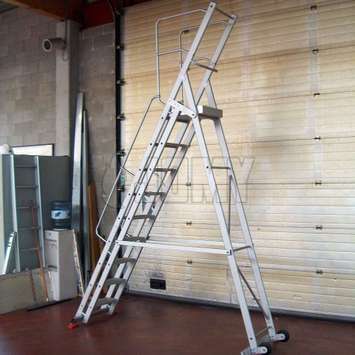 Your own ideas can be integrated in the stepladder construction. 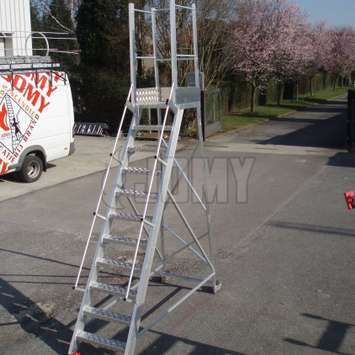 Your preferred JOMY stepladder can be constructed for you on request.